It may surprise some of you to know that, in addition to being a full-time teacher and part-time blogger, I’m also an ordained priest. Under normal circumstances, I keep my ecclesiastical duties out of my writing, because I respect the separation of church and blog outlined by the Constitution. Today, though, I’m making an exception. As a man of the cloth, it’s my responsibility to give of myself unto the community. Usually, this means presiding over weddings and funerals, but on occasion, I’m called upon to render services of a different nature. Sorry, ladies. I’ve already got a fella, and his name’s Jesus. Last year, I attended Festivitas Natalis, a Portuguese-themed Christmas festival that involves lots of dressing up in olde-timey costumes. Then, last week, the Board of Education called me into action for the Festivitas Natalis photo-shoot. Craft service needs to branch out next time. Only so much wine and sacrament a guy can take. Forgive me, father, for I have swag. Coming soon to posters, websites, t-shirts, mugs, commemorative coins, and the Boys of Festivitas Natalis calendar, available anywhere quality beefcake is sold! I never really know how to answer this, because depending on where you are coming from, the answer could be anywhere from “terrible” to “not bad.” It’s all about how you set the benchmarks. My impression is that most people have two benchmarks: zero and fluency. Those are poles, and anything in between is evaluated relative to one or the other. In fact, some people will even replace the question “How’s your Japanese?” with “How fluent are you?”, as if the two were interchangeable. There’s a reason I only get this question from people at home: if you see someone in person, you can tell how skilled they are in a language within minutes. And in person, you don’t judge someone’s ability relative to absolute states like zero or fluency, but as a function of what they’re able to do with the language. 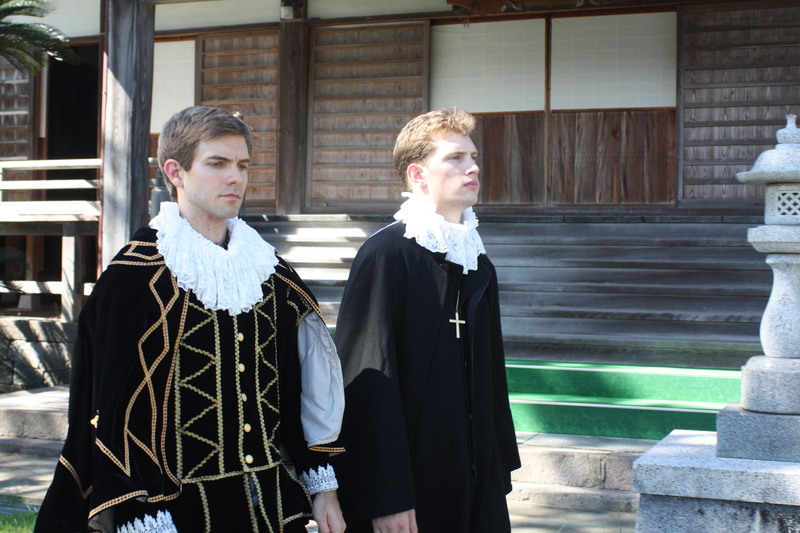 For example, when I first arrived here, I really couldn’t do anything in Japanese other than greet people and introduce myself. Now, there are lots of things I can do, like go grocery shopping, ask directions, buy train tickets, and order in a restaurant. I’m certainly not fluent–and if you want to place in a relative context, I’m not even close–but I’m more capable than I was a year ago. But if you aren’t here to see it for yourself, it’s hard to assign a skill level to random examples like these. If someone asks me about my Japanese, and I say, “I can go through customs at the airport no problem,” that doesn’t really answer their question. Such a response is likely to be met with puzzlement. Unless you work as a customs official, the ability to go through customs does little to inform you how my Japanese is progressing. Despite being a very concrete, specific example, it’s too abstract to help the average person understand your ability. This afternoon, I finished reading my first Japanese book. Now, I’ve read plenty of books by Japanese authors, and in fact they are a special interest of mine. But they had all been translated into English. Today, I finished one in Japanese. Before you get too excited, I have some disclaimers. First, what I read wasn’t exactly 1Q84, or any other great work of Japanese literature. It was a manga–a comic book–that is wildly popular amongst elementary school students in Japan. If you live in Japan, or are otherwise interested in Japanese culture, you will no doubt recognize it straight away: Meitantei Conan, which means “Great Detective Conan” in translation. As you’ve no doubt guessed, Meitantei Conan is a detective manga. Actually, it’s many. I finished the first volume today, but with 76 and counting currently in print, I could spend a lifetime sleuthing along, one word at a time. I somehow doubt any of my readers in the U.S. are interested in young adult detective stories, but if I’m wrong, it’s available in America under the title Case Closed. My second disclaimer is that, when I said it would take a lifetime to finished 76 volumes of Conan, that wasn’t terribly conservative. At just over 180 pages, all of them filled with pictures, this book took me almost as long to finish as 1Q84 itself earlier this year. That’s because, while my vocabulary is improving, it’s not good enough to read more than a few sentences in a row without referencing a dictionary, often two or three times. As you can imagine, this slows things down just a bit. But so anyway, I can’t read very many kanji. Conveniently, neither can most Japanese elementary school students, so children’s novels like Meitantei Conan frequently include furigana, which are small characters that give the phonetic spelling of the word represented by the kanji. Now, the presence of furigana allows me to read words that would otherwise be beyond my ability, but breaking the kanji down into phonetic characters and then looking up the spelling in my dictionary isn’t an exact science for any number of reasons.Sometimes, the word just isn’t included in my dictionary. 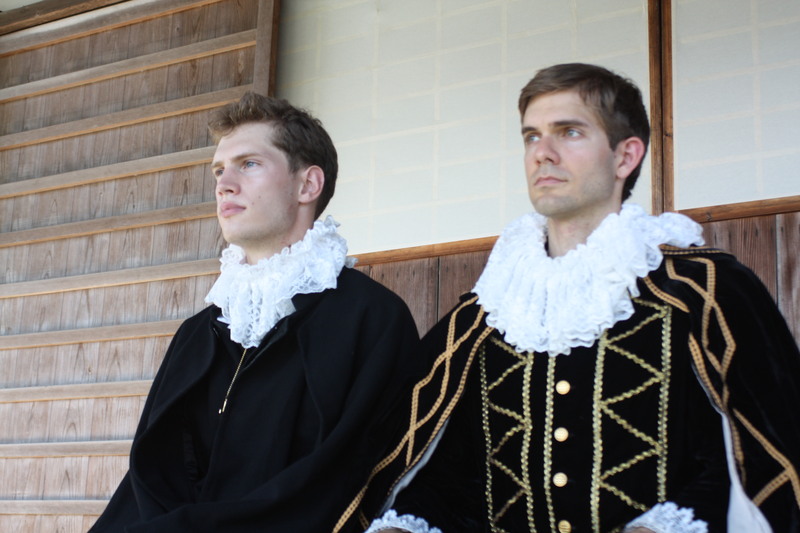 Other times, variations resulting from conjugation or other stylistic flourishes make it difficult to figure out which word–out of half-a-dozen possibilities–is being used. Context helps, but it doesn’t always help enough. And, in the end, I’m left to do what we all do when we’re learning to read–take a guess and move on. In general, a missed word here or a tricky sentence there isn’t enough to knock you off the storyline, especially when there are pictures to guide you. We didn’t start the fire. It was that kid. 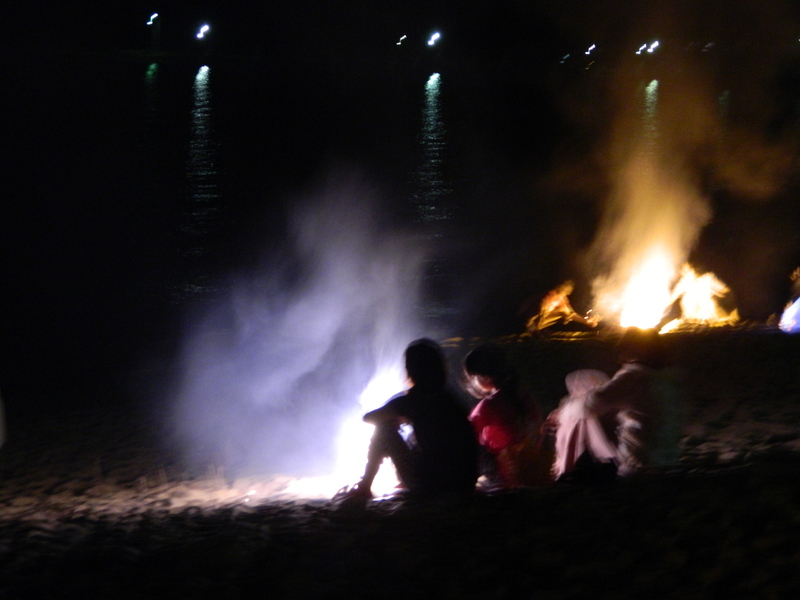 Every August, Japan celebrates Obon, a national festival that honors the memory of one’s ancestors. While there are multiple events that take place during Obon, it culminates each year with toro nagashi, a ceremony where boats filled with paper lanterns and carried through the streets and down to the water’s edge. Once upon a time, the boats were then set alight, but unfortunately, that’s no longer considered in keeping with the times. Today, they just dismantle them and reuse the parts the following year. Now, toro nagashi is a beautiful, photogenic event, with boats filled with lanterns reflecting off the water, and people carrying torches, and as you can probably tell by the fact that I am describing this in lieu of a picture, I forgot to bring my camera down to the beach on the big night. It kind of snuck up on me. My bad. 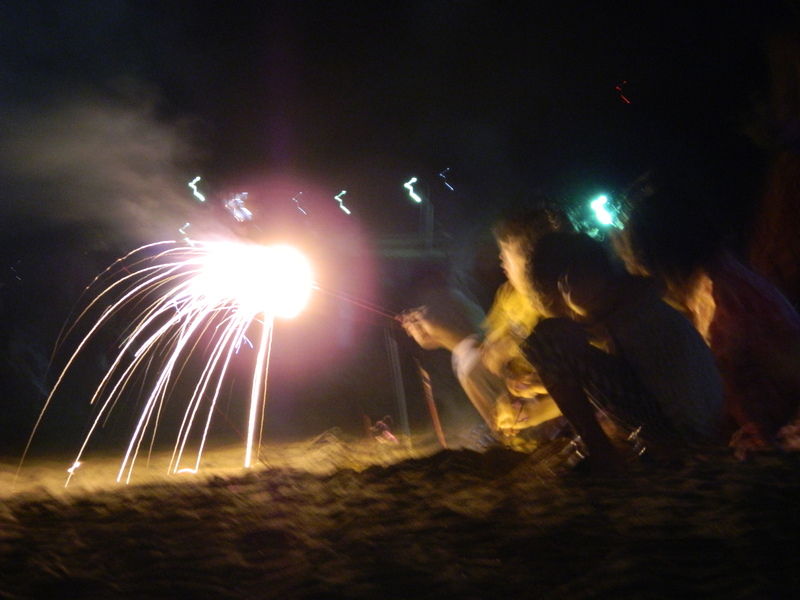 As a consolation prize, though, I do have some pictures of the fireworks festival that was held in Kazusa the night after toro nagashi to celebrate the end of Obon. 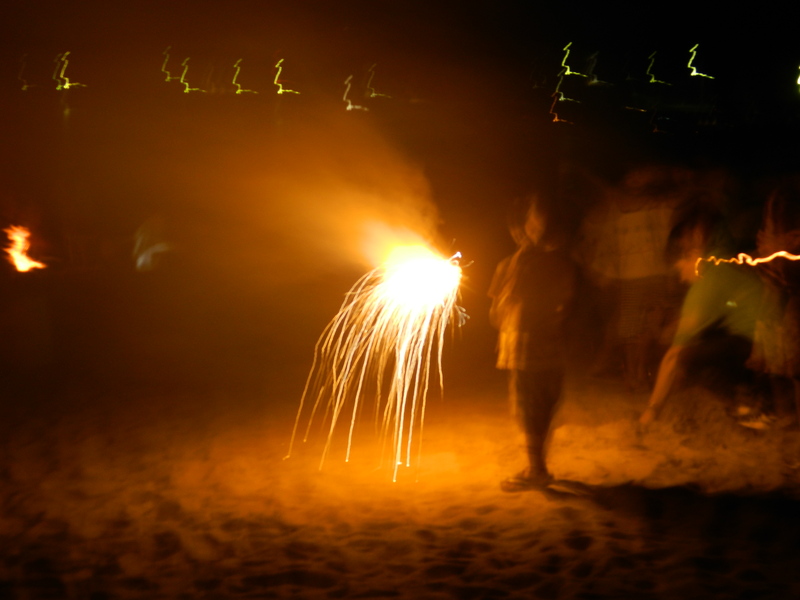 Unless you’re very skillful, though, pictures of fireworks tend to be kind of dull in my opinion. The timing is tough to get down, and really, it’s something you kind of have to be there for. 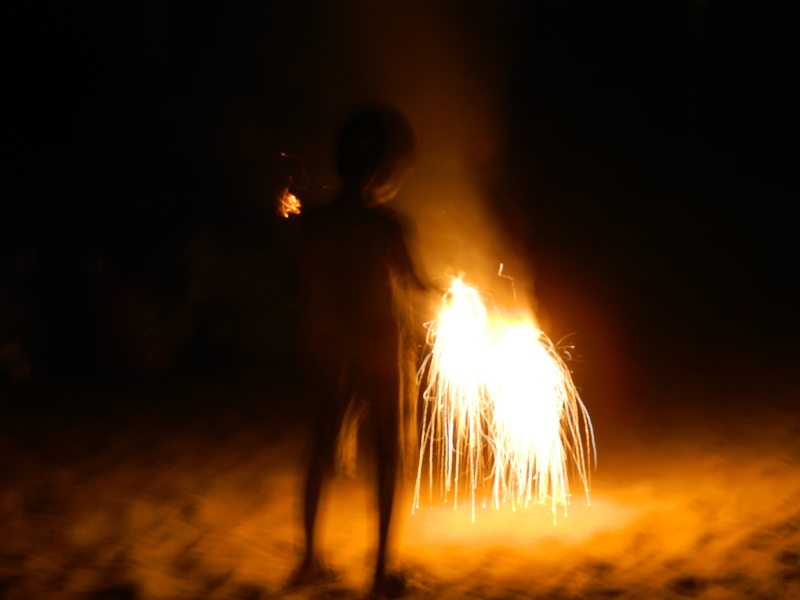 But so, rather than fireworks, what I have are mostly pictures of children playing with fire. 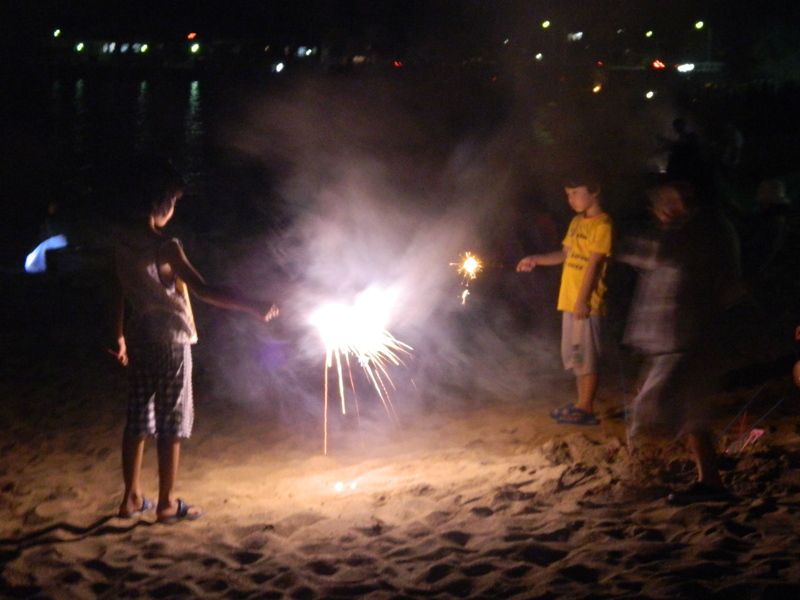 Unlike in the United States, where some states prefer that fireworks be operated by licensed professionals only, fireworks are a family affair in Japan. They sell them at convenience stores, hardware stores, drugstores, and pretty much everywhere else you can think of. As far as I can tell, there are no restrictions on who can buy them, and there certainly aren’t any on who can use them. 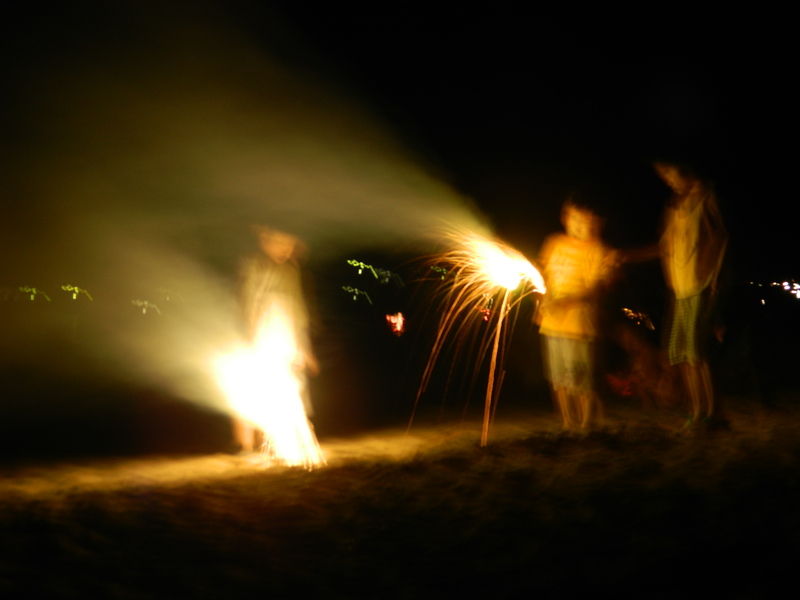 On any given summer evening, you’re likely to find children down at the beach lighting off sparklers and Roman candles, sometimes under the supervision of an adult, other times not. 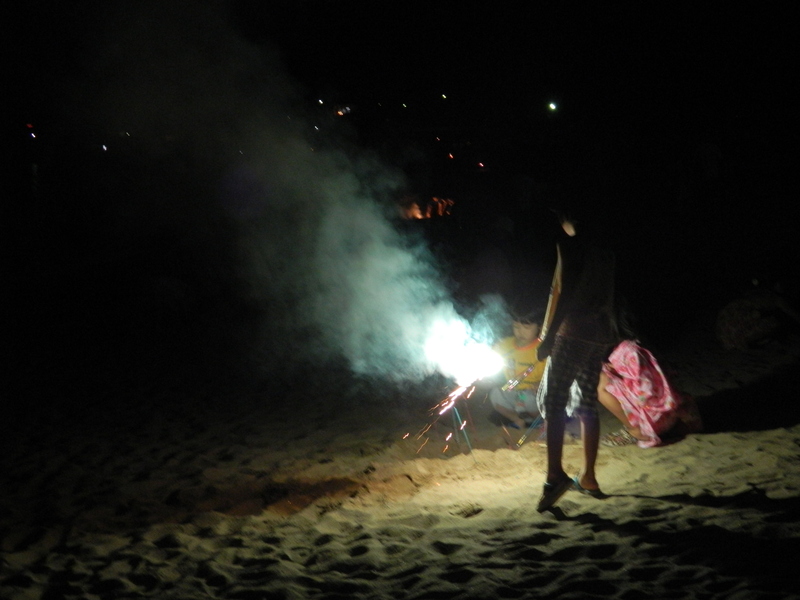 But anticipation of the fireworks display brings firebugs from far and wide to Maehama Beach, where the sand is lit up for hundreds of meters by tiny pyrotechnics, and the hum of the surf is drowned out by the cackle of future arsonists. The pyros are our future. Godspeed. Yellow shirt about to receive a cruciatus curse. Chestnuts roasting on an M-80. Pink yukata says it all: chicks dig guys who start fires. OH MY GOD HE’S GOT THE ELDER WAND! Looks like he prematurely fired his ‘work.